The Phoenix Tobacco Co. was formed in March of 2002 with the educated "guess" that ready made cigarettes were going to skyrocket in pricing due to increased taxation over and above normal price increases. The folks at The Phoenix Tobacco Co. wanted to provide the price-conscious customer with an alternative. The Phoenix Tobacco Co. suggests the you become your own factory and create the smooth satisfying smoke you are looking for using VALUE BRAND Select RYO tobaccos. Why pay more when you can have quality and taste at a GREAT price? The easy-filling cut of these great tasting cigarette tobaccos will make dealing with the art of rolling or filling tubes a breeze. We invite COMPARISON! Our product is made in the USA! These smooth, satisfying and enjoyable blends are an extraordinary value and provide exceptional smoking satisfaction. VALUE BRAND Select RYO is available in Full Flavor (a satisfying rich blend), Light (a mild and smooth blend), Menthol (a cool and refreshing taste), Natural (Plain GOOD! ), Ultra Light (a mellow taste) and our Canadian Style (a very high grade Canadian tobacco). 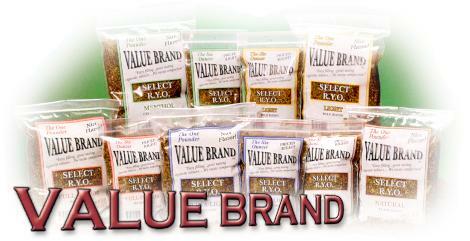 VALUE BRAND Select RYO is available in a 6-ounce polybag and a 16-ounce polybag. The 6-ounce bags come 32 bags to the case and the 16-ounce bags come 12 bags to the case. We sell only to State licensed tobacco distributors throughout the U.S. You can mix the styles and sizes to meet our minimum shipping standards in order to receive FREE shipping. For more information on this fine line of high value products click on the email link below.